Pope Chooses side of Israel’s Enemy? LISTEN NOW! It was only a few hours ago that gunfire filled the air and 5 gangs clashed together at the Twin Peaks restaurant resulting in 9 dead and 150 injured. While the chaos ensues, punches are thrown, and chains whip the air, can you imagine someone walking solely into the brutality with this statement: I hope that you are an angel of peace? Absolutely not. Reportedly, since 2005, 11,000 rockets have been shot over the border, into Israel, from the Gaza strip. Eleven thousand rockets shot at the Israelis, those that are Jewish. Open hatred towards the Jews. This is very similar to what Hitler did, he hated the Jews. He hated Christians. CBN is reporting how the Pope has just decided to recognize and embrace Mahmoud Abbas and a Palestinian State. 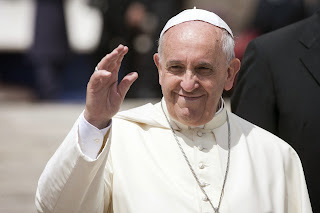 In an interview with Dr. Paul Bonicelli, a Regent University Professor, Bonicelli shares how the Pope has taken sides in regards to Israel. As the church, we cannot embrace the beliefs that are anti-Jesus, and think that it will work out well in the end for those who believe that Jesus is the Christ. The days of urgency are only increasing more and more. It is for each of us to choose who we will serve, and serve wholeheartedly. Hear more about these critical events, how this compares to the history of Adolf Hitler, and so much more. Greg and John shared in this segment. What If Terrorists Could Shoot This Rocket at Your Country?